Whether you're a fan or hate his guts, none can deny the brilliance and talent that Lewis Hamilton possesses in F1. A talent so exceptional that he virtually has no equal. When Hamilton first appeared on the Formula 1 circuit in 2007, most people already knew about the rookie that obliterated the GP2 (F1's feeder series) the year before en route to the championship. "One day I’ll race for you"
Everyone knew about the 10-year-old that, years ago, told Ron Dennis, then team boss of the McLaren-Mercedes team, "one day I’ll race for you". Cocky? Perhaps. But that bold statement came to fruition when he lined-up as the second McLaren-Mercedes driver alongside two-time world champion, Fernando Alonso. 73 out of 99 race wins. In his first nine races that year, Hamilton appeared on the podium nine times and racked up two victories as well. He would win a further two that season to end the year in second place behind Ferrari’s Kimi Raikkonen, but ahead of Alonso. Hamilton and Alonso both scored 109 points that year to Raikkonen’s 110. Come 2008 and Hamilton had made McLaren-Mercedes his own, Alonso returned to Renault, and the rookie is ready to grab his first championship. 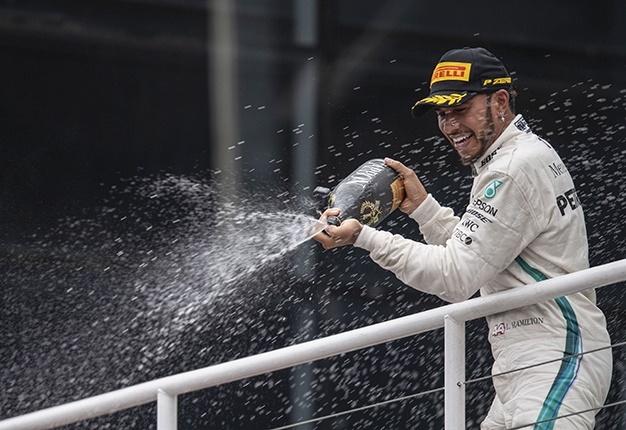 It was an up and down season for Hamilton; being embroiled in an epic battle for the championship that ensued until the last corner of the final lap in the grand finale race of the season. Throughout the year Hamilton managed to win four races, including his home race in Great Britain but it was two fewer than what Felipe Massa of Ferrari managed. Brazil was also Massa's home race, which he won, but the race got turned upside down when the rain came pouring down. 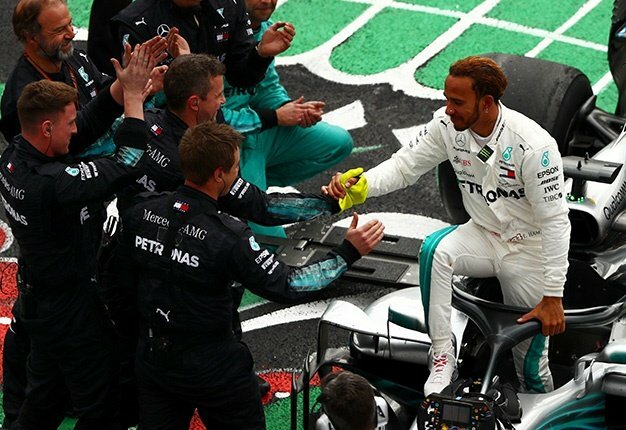 Teams and drivers scrambled for the best strategy, pit stops were performed as if it was going out of fashion, and it left many a driver in positions they would not be accustomed to, including Hamilton, who needed a fifth-place finish to win the title. As the chequered flag dropped, it was Massa who crossed the line first and jubilation erupted in the stadium as the local hero finally captured the F1 championship! The first Brazilian driver to do so after the great Ayrton Senna. Then it all came crashing down for the Massa family, Ferrari, and all of Brazil, as Hamilton passed Toyota’s Timo Glock for fifth place. Massa would be champion for 30 seconds, at least he knew what it felt like, but Hamilton took the championship home. Hamilton 98 points, Massa 97. It would be six seasons (including 2014) before Hamilton would win another championship; the longest gap between championships in F1 history - until Kimi Raikkonen's new record earlier this year. Having been a loyal to McLaren for years, Hamilton announced in 2012 that from 2013 he’d be driving for the Mercedes factory team. It was a move that literally shocked the F1 fraternity because Hamilton always said that he’ll remain with McLaren because he is loyal to them. But following years of being uncompetitive and failing to win championships it was time for change. Mercedes told Hamilton that they would not win the championship in 2013 but in 2014, when the new hybrid era would begin, he would be champion. A prediction that ultimately came true. That year Hamilton romped to the championship in emphatic fashion, taking eleven wins from the 19 grand prix hosted that year. He well and truly obliterated his team mate, Nico Rosberg, who struggled to keep pace. Hamilton and Rosberg had been good friends, but bigger rivals since their teenage years, but that all came to a head in Belgium when the two tangled and the former was forced out of the race around Spa-Francorchamps. Though the friendship was well and truly over, Hamilton still managed to win the championship at the end of that year; despite the ridiculous once-off double-points scoring at the final race in Abu Dhabi. Rosberg would continue to be Hamilton’s greatest rival but the Brit adapted to his new surroundings and managed to build the entire team around him - much like Alonso in 2007. The title would come his way in an almost clinical fashion, with the veteran driving with extreme precision. That year Hamilton won 10 of the 19 races, with Rosberg and Sebastian Vettel (who switched from Red Bull to Ferrari) taking six and three wins, respectively. It was a season known for Hamilton’s brilliance on track but also Vettel’s jump to Ferrari in a bid to reclaim the glory days when fellow German, Michael Schumacher, and Ferrari ran rampant in the early parts of 2000. Hamilton would close the year with 381 points to Rosberg’s 322 and with the very important third championship to his name. 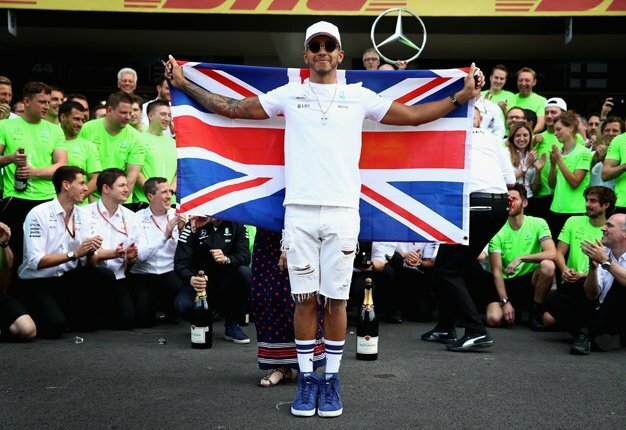 It also enabled Hamilton to join a respected list of drivers whom have all won three championships, consisting of Jack Brabham, Jackie Stewart, Niki Lauda, Nelson Piquet, and Hamilton’s own hero, the aforementioned Senna. In 2016, the Mercedes team opted to shake its garage-up a and ordered that Hamilton and Rosberg change crews. This meant that the guys working on Hamilton’s car and ensuring that his part of the garage run smoothly would now work with Rosberg, and vice versa. It proved to be a telling move as Rosberg won the championship that year. Rosberg would announce his retirement from the sport at the end of that season. But Hamilton stuck around and when the new season began, he was partnered with Valtteri Bottas who came over from Williams. Bottas would win three races in 2017, but Hamilton still beat him with nine wins. And what everyone was hoping for, a resurgent Ferrari and Vettel, finally took the fight to the dominating Mercedes team. Ultimately the challenge would still prove to be a tad out of reach. Vettel may have won five races last year, including three of the opening six races, but it was as if Hamilton and Mercedes only got better as the season progressed. Frustration crept in at the European GP in Azerbaijan when Vettel, clearly in the faster car on the day, mistook Hamilton’s actions behind the safety car for brake-testing him (when a driver would accelerate and brake suddenly). Vettel steered into the side of Hamilton’s car, giving him a penalty; though some pundits believed that 1) Vettel should have been disqualified from the race, or 2) disqualified from the championship. Vettel’s season went from bad to worse while Hamilton stuck to his guns and won the championship for the fourth time. Hamilton 363 points, Vettel 317. 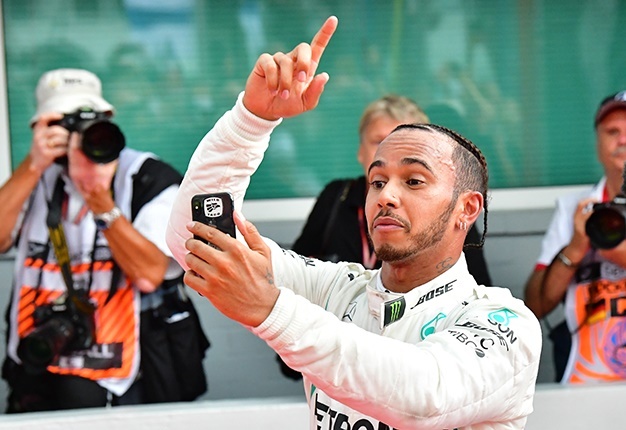 Though this year’s championship is drawing to a close at the 2018 season finale in Abu Dhabi, Hamilton has already secured the championship in Mexico two races back. 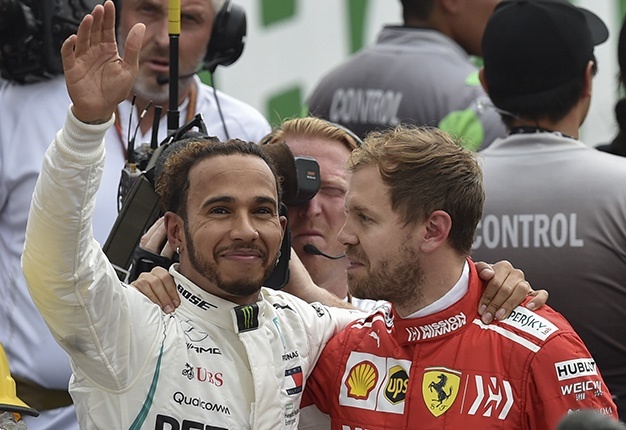 Again it was Vettel who gave Hamilton a run for his money, but due to unforced errors behind the wheel, his championship hopes began to fade as Hamilton capitalised on those mistakes. Vettel’s Ferrari was clearly the faster car this season, but Hamilton and his brilliance made it seem as if the performance difference was of no concern to him and his title challenge. Throughout the year the two men battled it out for supremacy and to see who’d become only the third driver in the sport’s history to win five championships alongside Juan Manuel Fangio (if you discount Schumacher on seven titles). It was a difficult season for both but as the pressure mounted it was Hamilton who handled it better. It was Hamilton who kept a cool head in the face of adversity. Vettel, clearly in the superior car, somehow got it in his mind that everything was going awry when it wasn’t. Those unforced errors cost him dearly in the end and dare it remain to be seen whether Hamilton has finally broken this Ferrari camel's back. Prior to the race on Sunday, Hamilton has scored 383 points to Vettel’s 302.